The Giant Rainbow Unicorn Pool Float will turn your backyard into a summer fantasy! Ever want to ride a unicorn? Well this summer is the perfect chance to do just that! 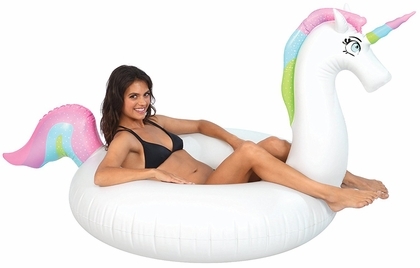 Simply inflate the unicorn pool float and you're good to go. Lean back and relax the day away on this beautifully designed float. Or bring it out at the next pool party, and impress your friends with your magical pool decor. Add a colorful flair to your summer! Measures 75" long. Availability: The Inflatable Rainbow Unicorn Pool Float ships in approximately 1 business day.